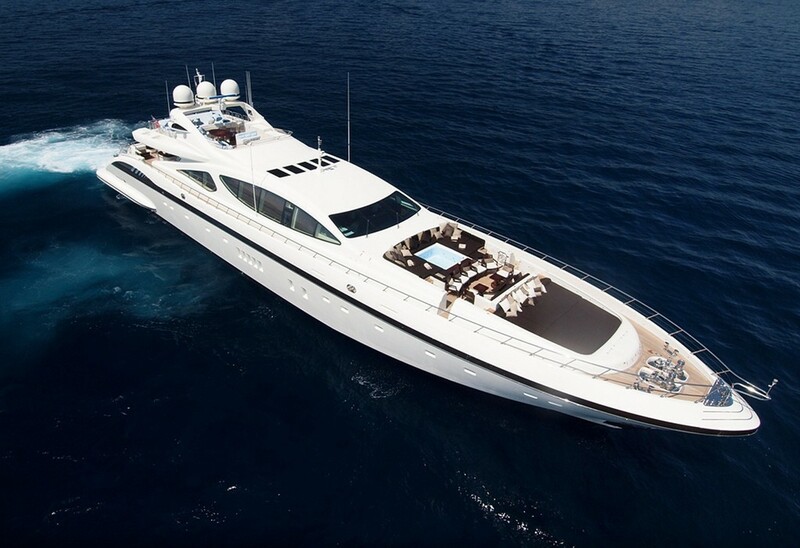 The Mangusta 165 (around 50m) superyacht ZEUS is the largest open style sport motor yacht in the world. 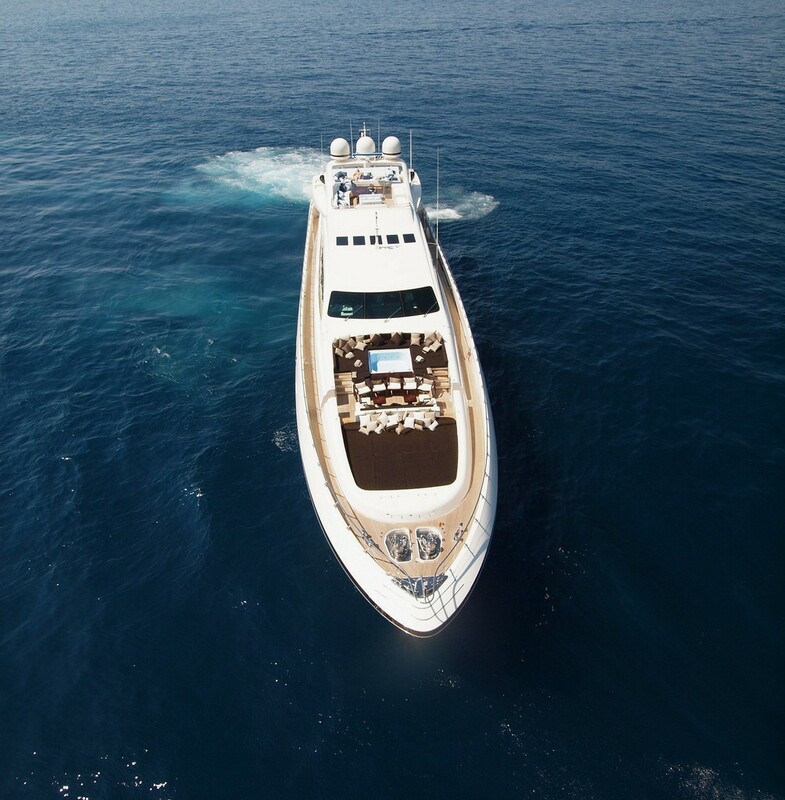 Launched in 2009, motor yacht Zeus is available for select yacht charters vacations with up to 12 guests accommodated overnight in 5 cabins. 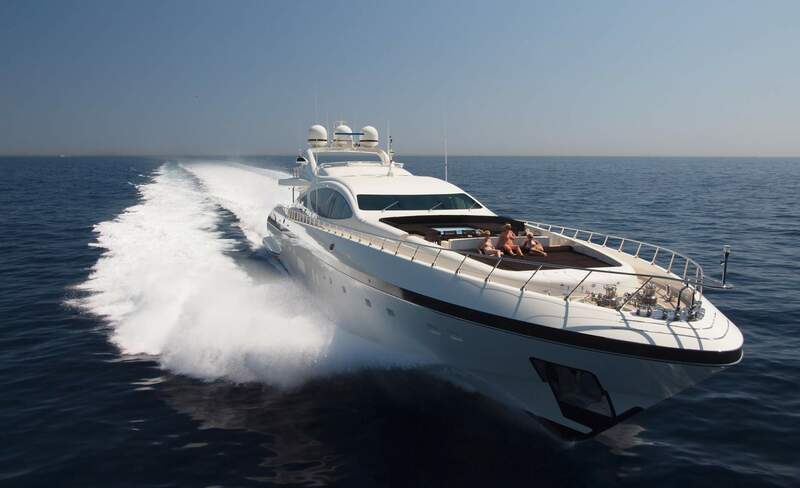 This fast, sleek, head turning and full planning superyacht reaches a top speed of around 37 knots, which exceptional for a yacht of this length. 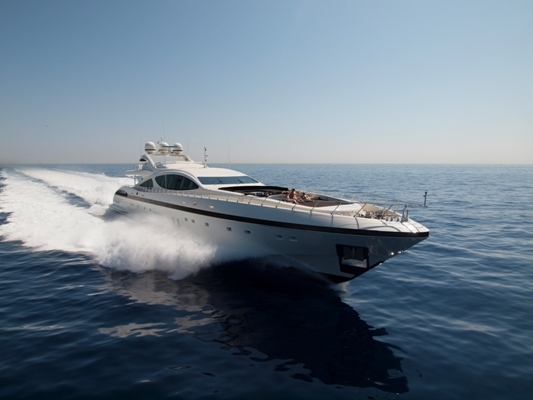 Her 3 x 4,556 hp MTU diesel engines provide the exhilarating power for this amazing speed. 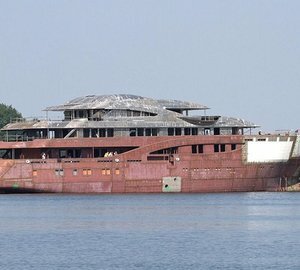 She can also ‘cruise’ at 24 knots. 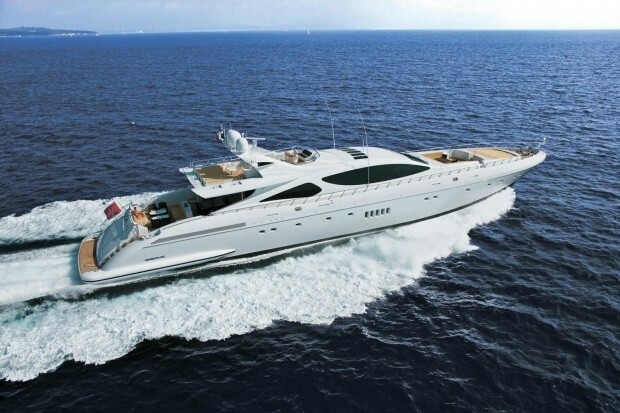 ZEUS had her naval architecture created by Stefano Righini and was built and conceived by Mangusta yachts. 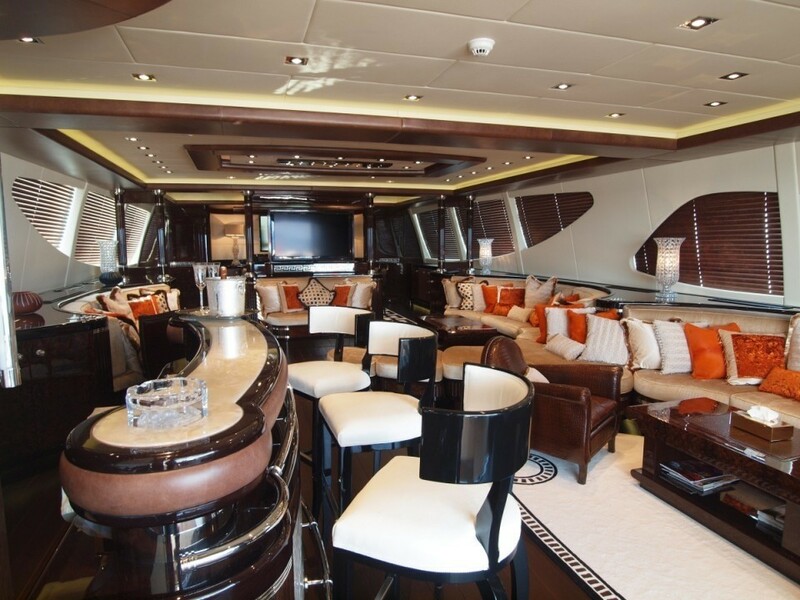 The elegant interior of the luxury yacht ZEUS is elegantly designed and features neutral fabrics and dark woodwork and a spacious main salon area. 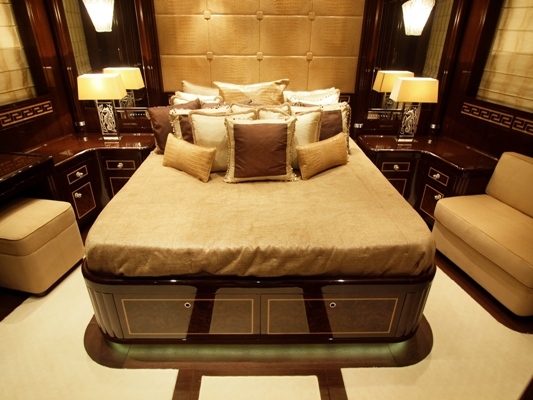 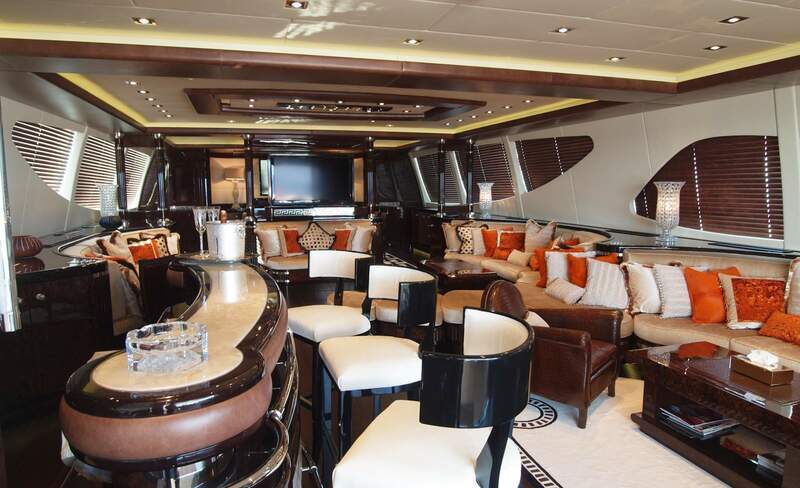 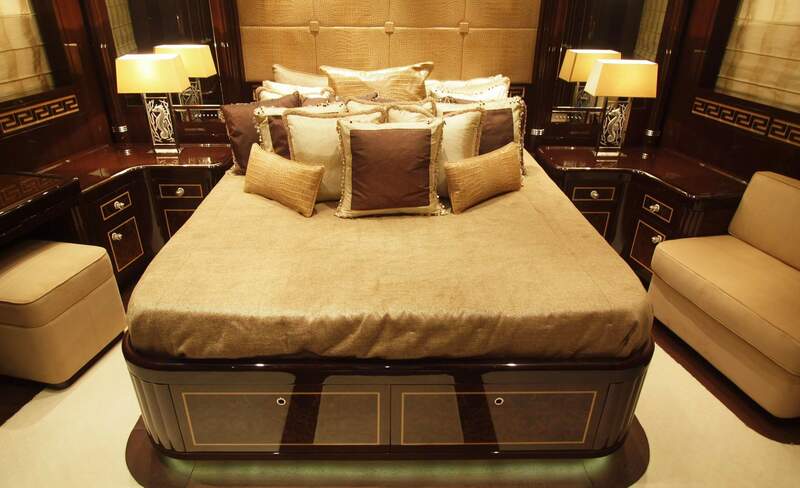 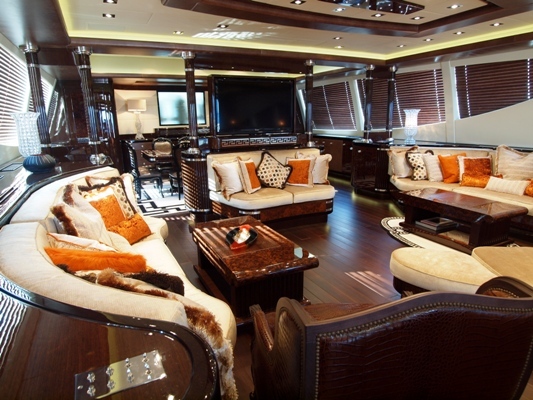 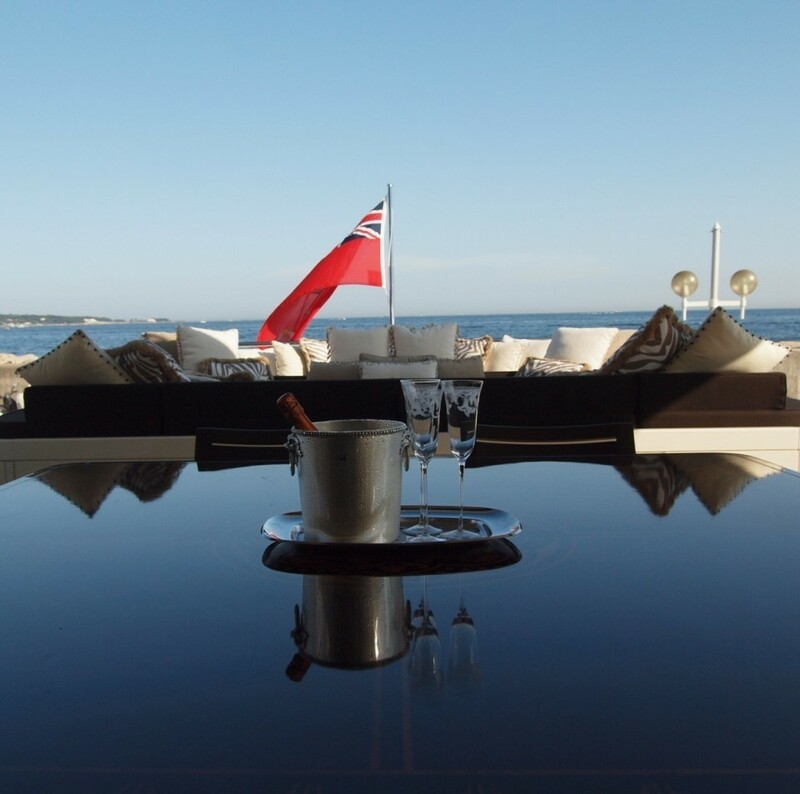 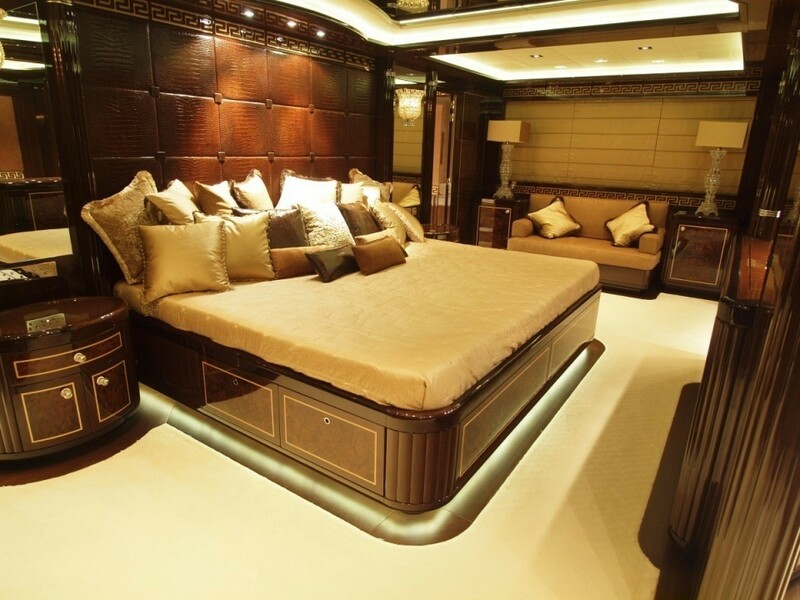 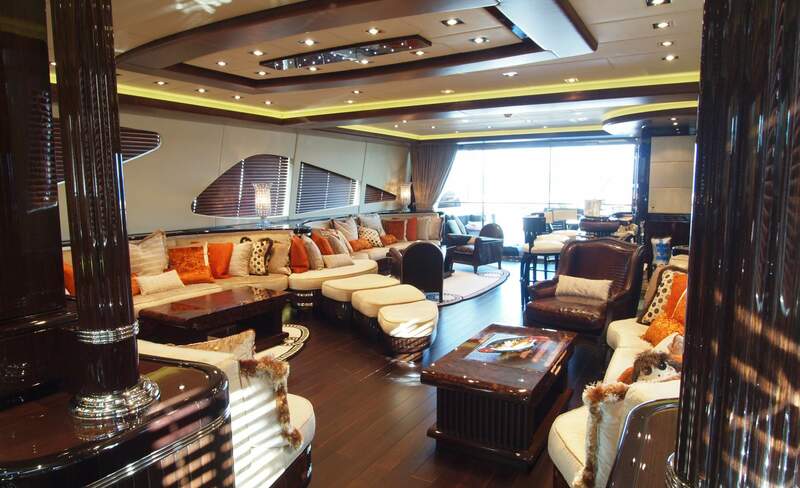 This space gives yacht charter guests easy access to sumptuous entertaining and seating and cocktail tables, a long bar. 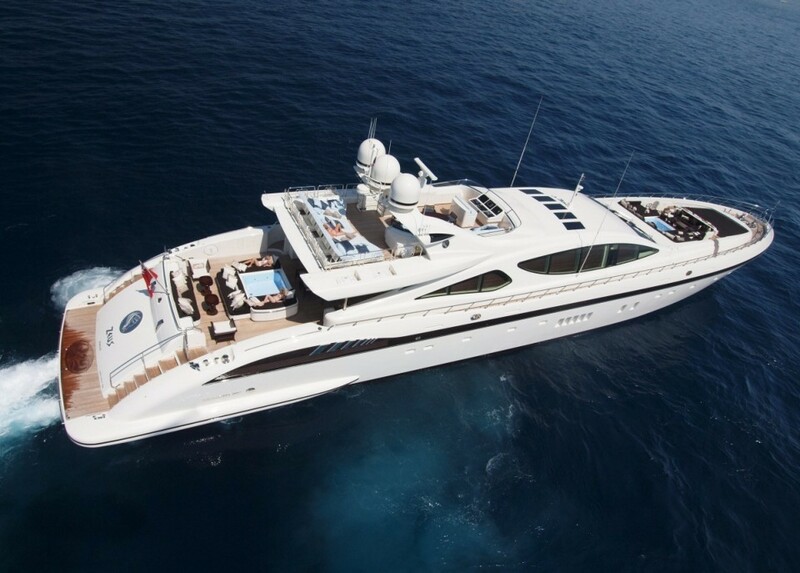 The yacht accommodates up to 12 yacht charter guests in 5 well sized staterooms below decks including the owner’s cabin. 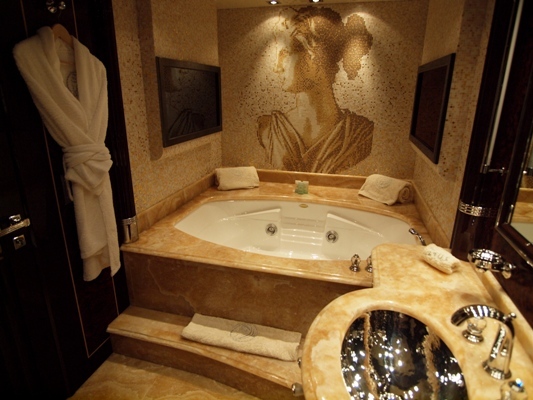 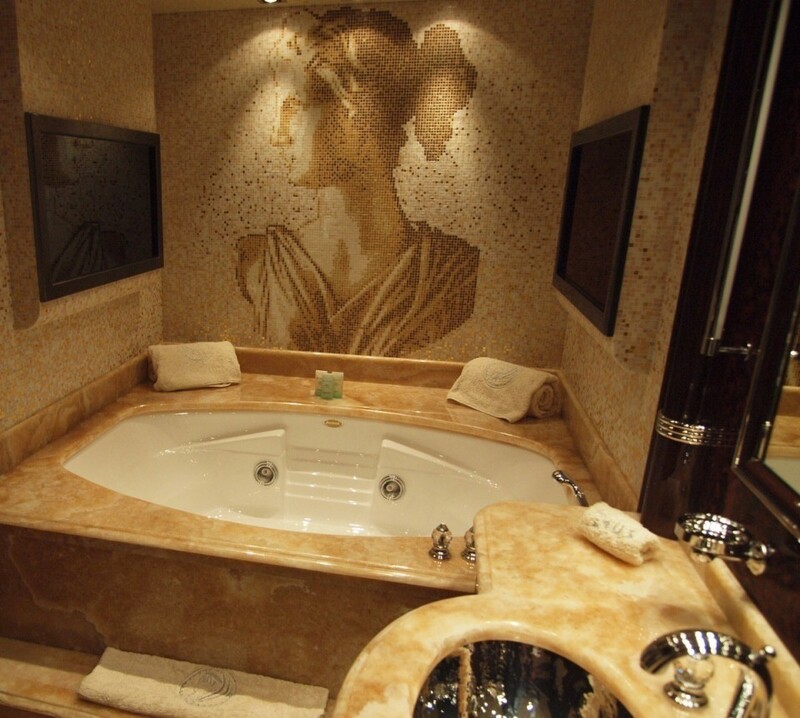 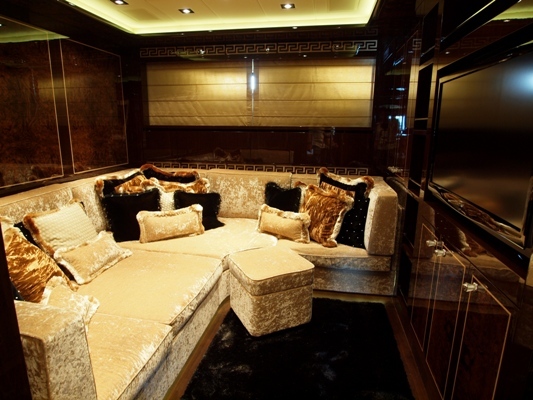 She also boasts a private office and a separate cinema room. 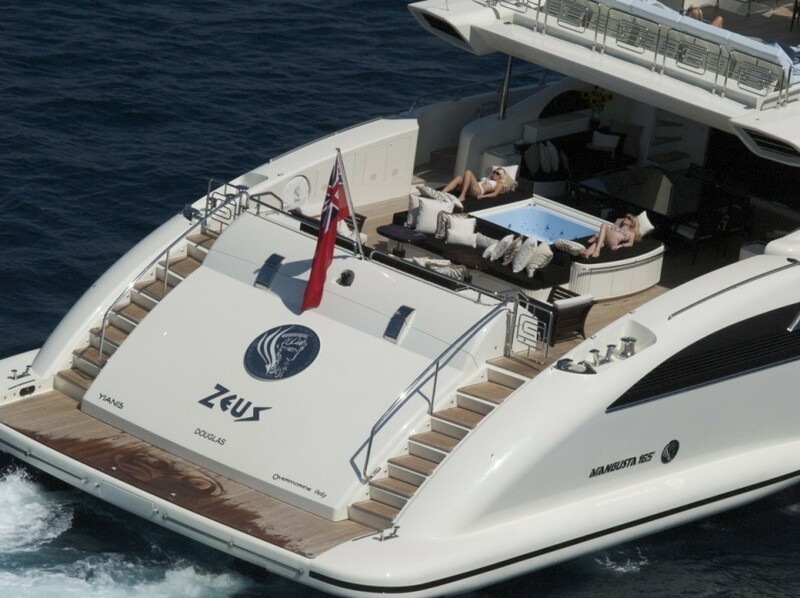 Yacht Zeus has a wonderful aft deck and foredeck arrangement, each with its own heated Spa Pools pool which can alternate as a sunbathing pad. 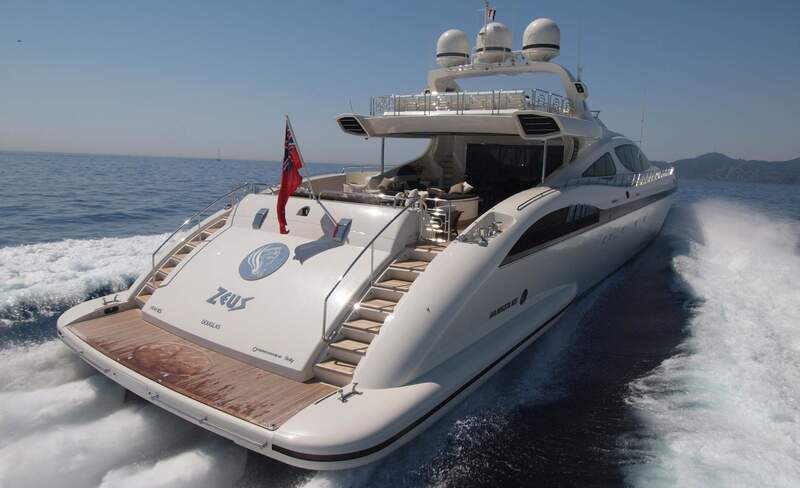 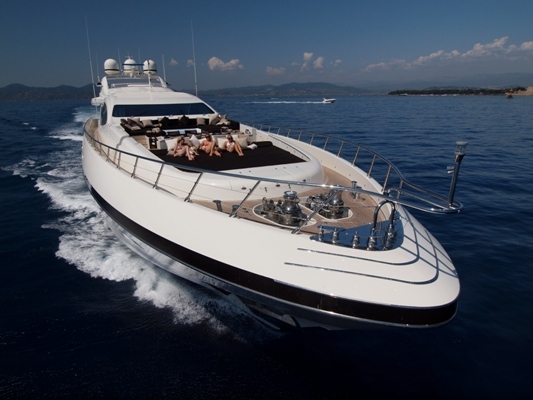 As for water toys and other yacht charter holiday amenities motor yacht ZEUS is equiped with a comprehensive list. 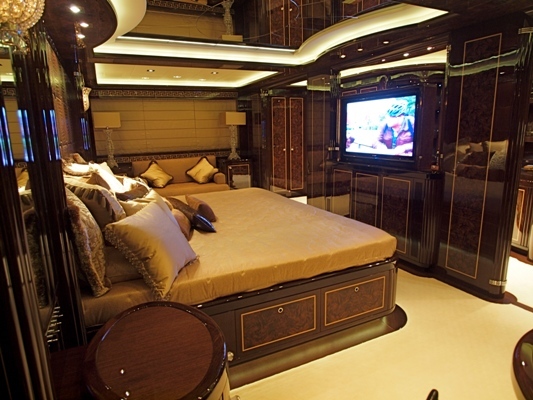 The internal and external electronic entertainment and Kaleidascape music and video on demand is first rate and features 24 TV screens. 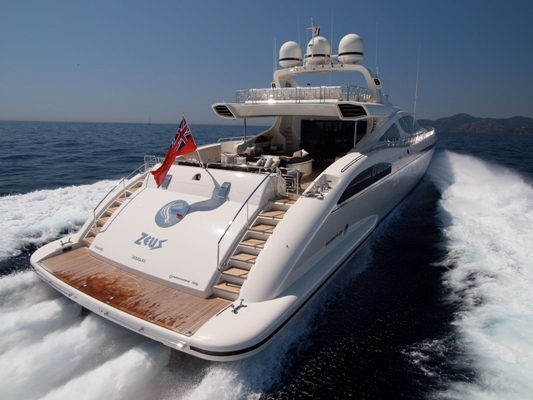 Her aft tender garage hydraulically at the push of a button and holds a stockpile of tenders and toys and opens for on the water fun. 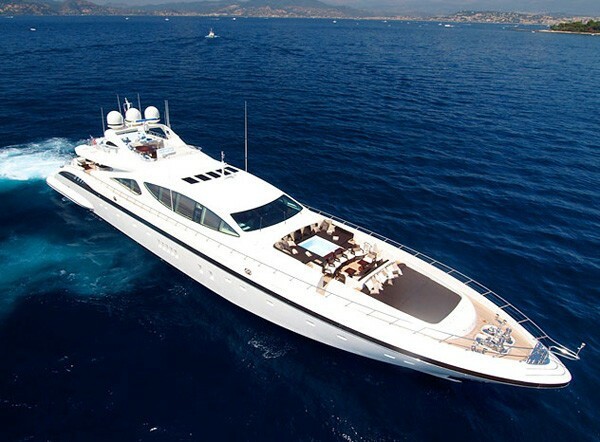 Well managed and well crewed super yacht ZEUS offers everything and represents one of the hot yacht charter picks available worldwide. 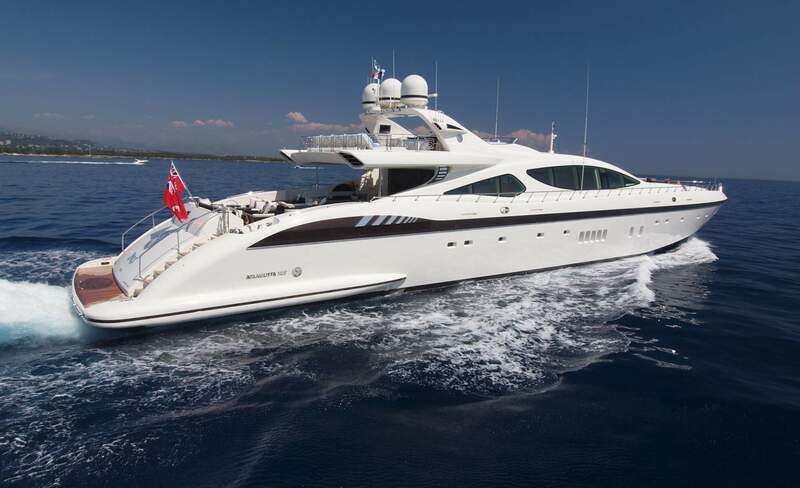 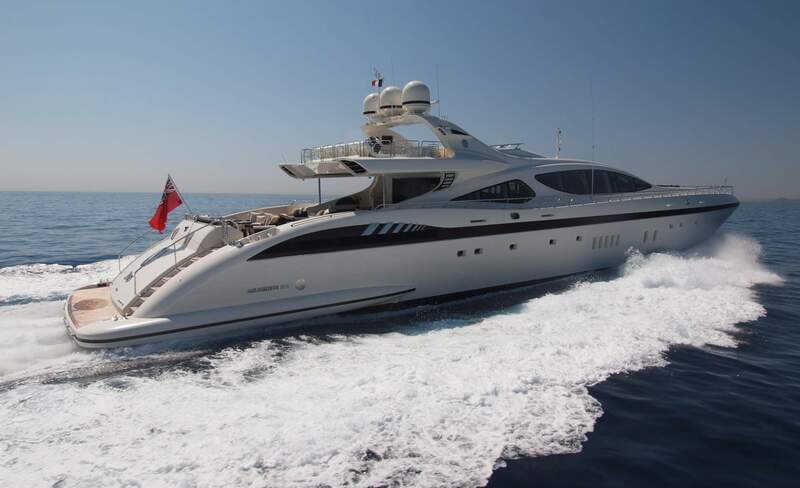 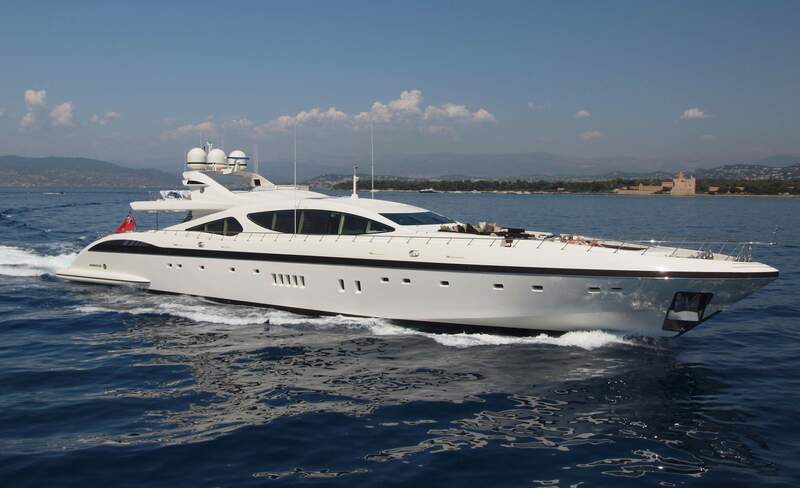 The Mangusta 165 Zeus has the following accommodation: An Owner's suite with a full width master suite with 2 ensuite bathrooms, sis and hers, one with a full size Spa Pool bath and one with a shower room. 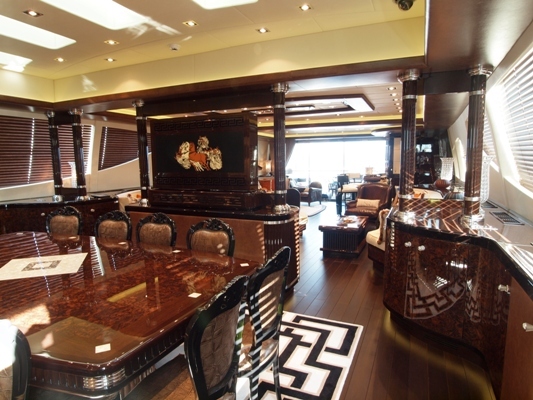 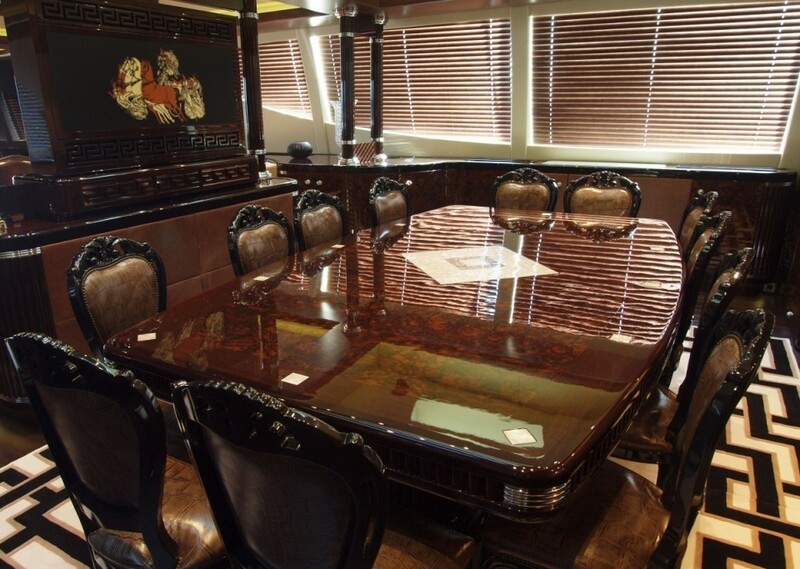 There is an owner's office with a self contained office on the Lower deck adjacent to the Owners Suite. 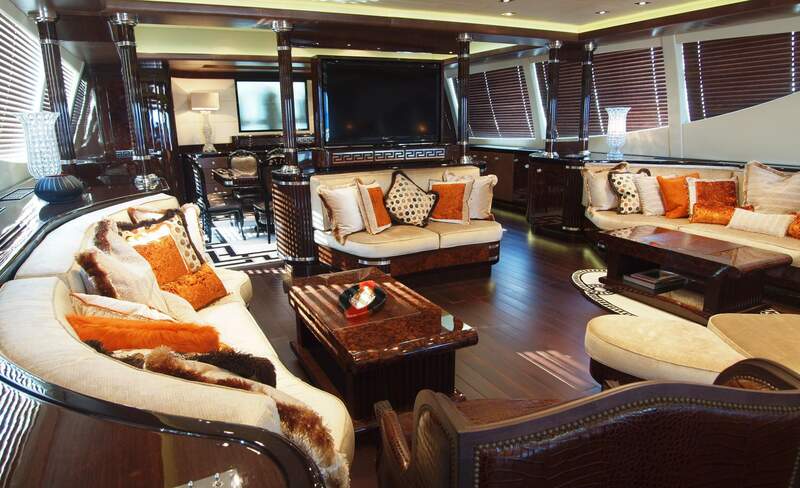 A dedicated media room is also located on her Lower deck. 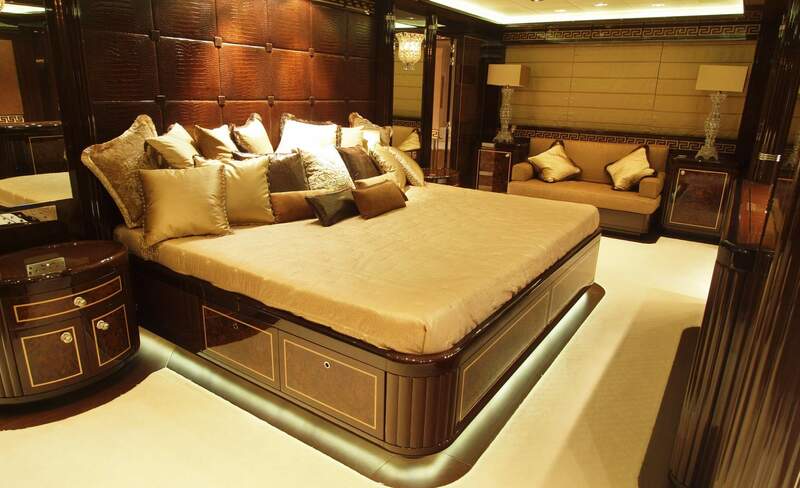 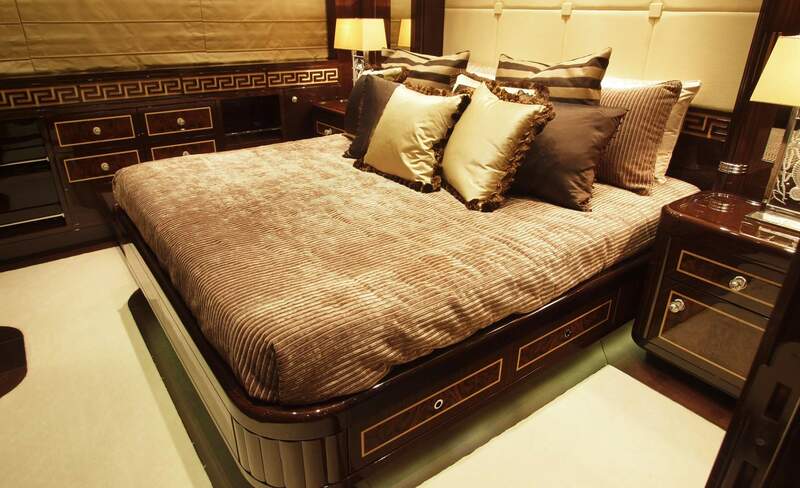 A full beam VIP cabin has a king size double bed, with 2 ensuite bathrooms, one with a shower and one with a bath. 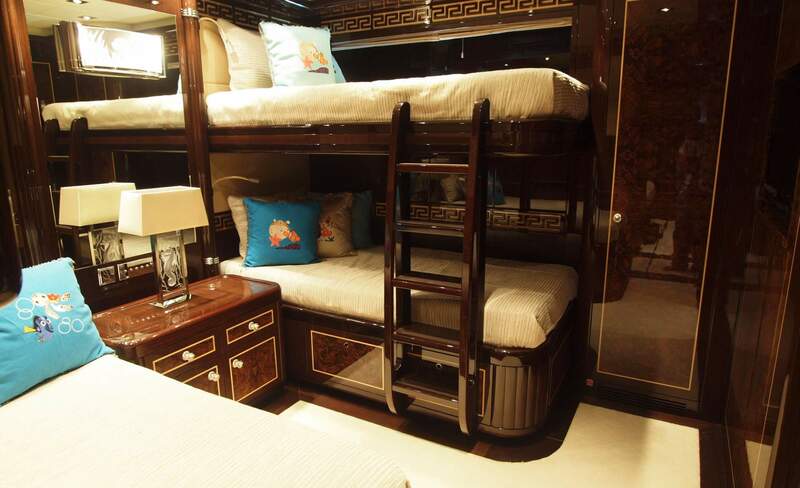 There are also two double guest cabins with en suite shower rooms and one triple cabin with a pullman bunk and an ensuite shower room. 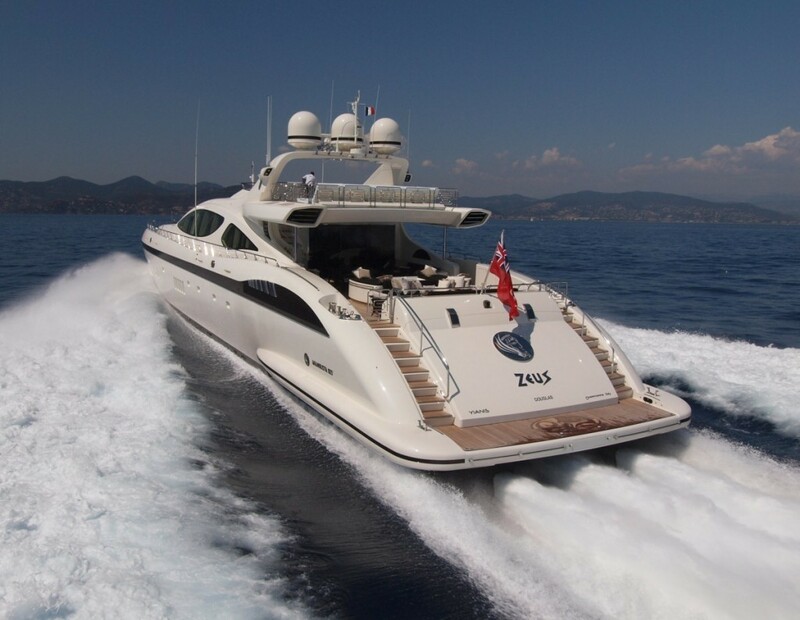 Motor yacht ZEUS has the following Tenders & Toys: a 6m Nautica jet tender, a 3 person sitdown jetski, a stand up jetski, a seabob seascooter, with a selection of water skis, water toys and inflatables. 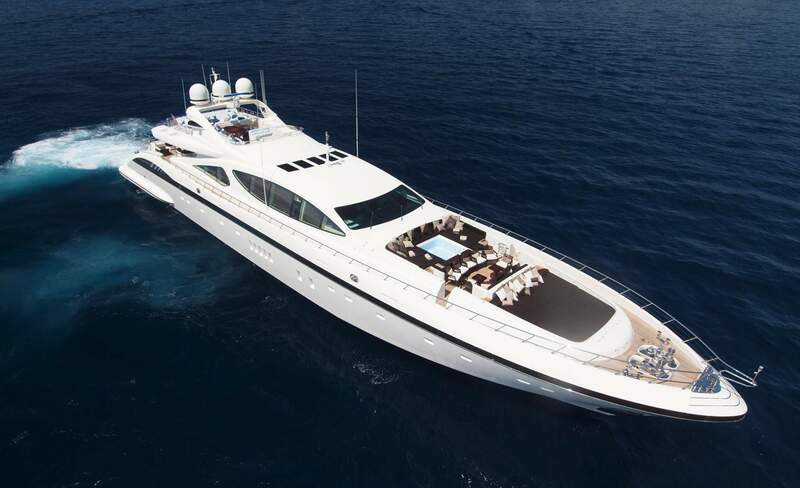 Her communications, VSAT (tbc), audio Visual Equipment and Deck Facilities, two Spa Pool's located under sunpads on the Aft deck and Foredeck. 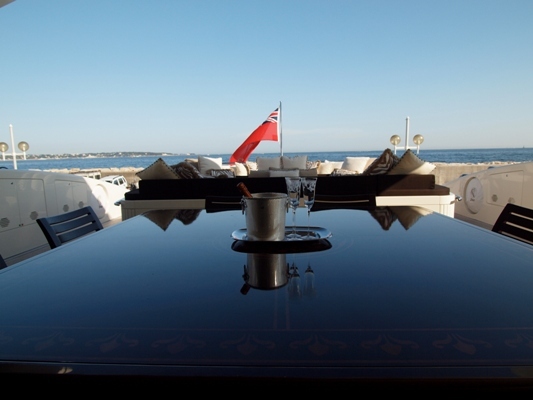 Hydraulic, extendable diving board that extends from Foredeck. 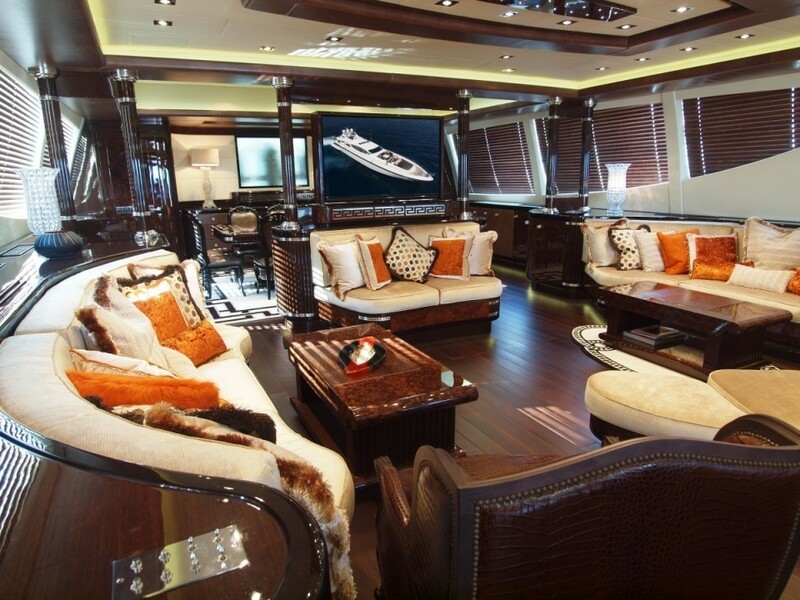 State of the art integrated entertainment system including full crestron controls, Kaleidascape music and video on demand and 24 Flat screen LCD televisions! 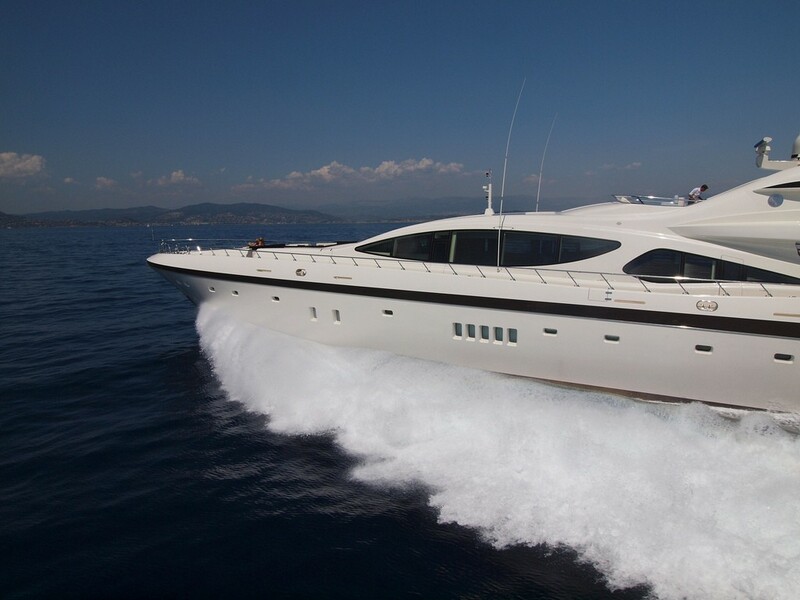 Broadband internet is available via VSAT (tbc) with a wifi system throughout the yacht.